During the 17th and 18th centuries, British and European wool sheep dispersed throughout the world, most notably to New Spain, the American colonies, South Africa, Australia, and New Zealand. Queen Isabella of Spain financed the voyages of Christopher Columbus and Hernando Cortez with money derived from the Spanish woolen industry. Columbus brought ultrahardy churro meat sheep to Cuba and Santo Domingo on his second voyage in 1493; in 1519 part of Cortez's walking food supply consisted of their descendants. Spanish conquerors took churros to South America, too, where they replaced the “sheepe of Peru” (llamas) as primary livestock. 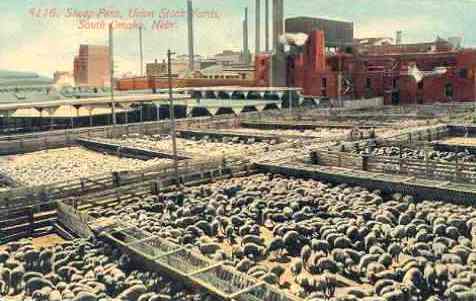 The vast Spanish woolen industry, however, was based on short-stapled, ultrafinewool Merino sheep, believed to have come to Spain during the 12th century with the Moors. By 1526 there were 3.5 million Merino sheep in Spain. None were exported by royal decree until 1786, when King Ferdinand VI of Spain sent his cousin, the French king Louis XVI, several hundred fine Merino sheep. Louis installed these valuable woolies at his estate at Rambouillet, where the finewool Rambouillet breed was born. Once the floodgates opened, affluent shepherds around the world imported Merinos, then and now the finest of the finewool breeds. Ferdinand shipped sheep from his famous Escoriale Merino Stud to the Dutch House of Orange, but the sheep couldn’t adjust to the high level of rainfall in the Netherlands. 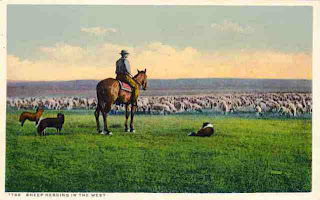 In 1789 two rams and six ewes from Ferdinand’s flock were sent to Col. Jacob Gordon in Capetown, establishing Merinos in South Africa (today there are 14.47 million Merino sheep in South Africa). The first sheep to reach Australia were fat-tailed meat sheep that arrived at Botany Bay in 1788 with the First Fleet. 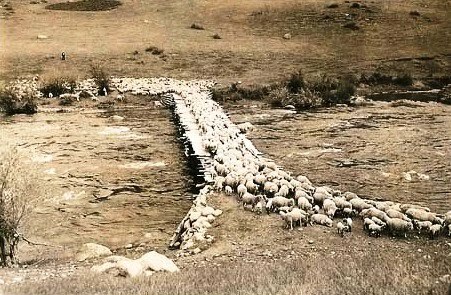 Thirteen Merinos followed in 1797. By 1830 there were nearly 2 million sheep in Australia, and in 1838 alone the annual Merino wool clip topped 4.4 million pounds. It's said that "Australia is built on the sheep's back" because her early wealth came from the sale of Australian-grown wool. Meanwhile, the first sheep to set hoof on the soil of the new American colonies set sail for Jamestown Colony in 1607; unfortunately, they were eaten during the harsh winter that followed. But additional sheep arrived at Jamestown in 1609, and fifteen years after settling Plymouth Colony, the Pilgrims purchased sheep from Dutch dealers on Manhattan Island (though they had a few sheep before then). By 1643 there were 1,000 sheep in Massachusetts Bay Colony alone. Records show that in 1646 Governor Winthrop of the Connecticut colony acquired a flock of Southdown sheep. And though Britain soon forbade further importations, colonial Americans continued smuggling in thousands of sheep. Britain, however, forbade the formation of an American woolen textile industry. In 1698 the penalty for involvement in America’s underground wool trade was having a hand lopped off. Nevertheless, true-blue Americans proudly wore garments made of American wool. The first woolen factory in the United States was established in 1788 in Hartford, Connecticut. Presidents George Washington and Thomas Jefferson, both of whom raised sheep at their estates, chose American-made wool suits to wear at their inaugurations. Naturally, Merinos came to America, too, particularly to Vermont, thanks to the efforts of William Jarvis, the American consul at Lisbon in Portugal. In 1809 Spain granted him permission to export 200 rams from the Escorial royal flock to Boston. 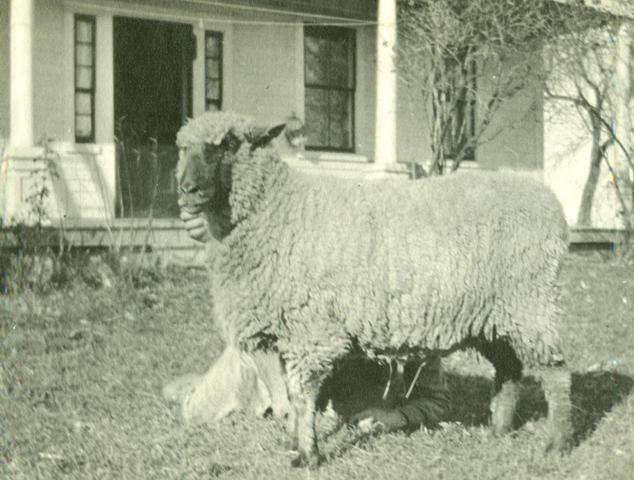 He returned home in 1810 and moved to his 2,000-acre farm in Weathersfield, Vermont, with 400 Merinos. Over the course of his lifetime, he imported 3,630 Spanish Merinos, effectively establishing the breed on our shores. 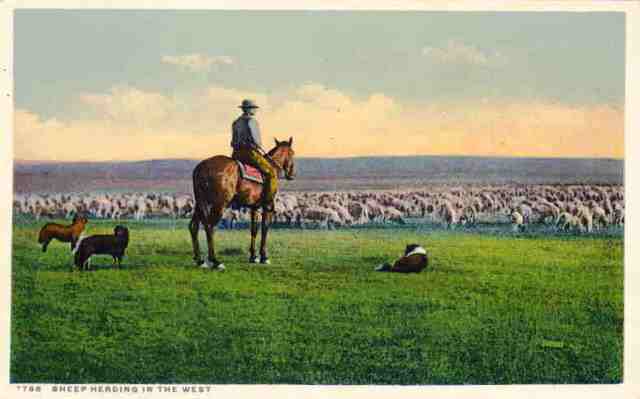 Beginning in the mid-1800s, American sheep production turned westward. Enormous flocks of up to 1,000 head of close-flocking breeds such as Rambouillets and Debouillets could be managed by a single herder and a few dogs, who stayed with the flock 24 hours a day as they grazed their way across the range. In 1942 American sheep production peaked at 56.2 million head; then the invention of synthetic fibers dealt a deadly blow to the wool sheep industry. According to USDA National Agricultural Statistics Service figures, there were only 5.62 million head of American sheep on January 1, 2010, and many of these are hair sheep breeds (meat sheep that grow hair instead of wool). So today’s average American wool sheep operation is a small-farm flock like my own, based on producing fleece for fiber artisans. But many of us keep sheep primarily for the pleasure of sharing our lives with these humble creatures. If you work with fiber, train herding dogs, or are searching for the perfect farmyard pet, consider sheep, even just a few. You won’t be disappointed.